spaces within Indian polity have been squeezing continuously and the present scenario of run up to 2014 elections is reflecting the state of disarray in parliamentary democracy. The mainstream discourse appears to have deliberately failed in bringing out the intrinsic relationship between ‘capitalism’; its ‘crisis’ and ‘democracy’ to the core of analyzing and understanding the present amnesia in political process. The characteristics of crony, fictitious, lumpen and speculative Capital that is on the driving seat of contemporary phase of capitalism are mirrored at the operational levels of parliamentary democracy - from governance to electoral process- in the form of corporate influences on policies and decision making, rampant corruption at the pinnacle of power, control of money and muscle-power in politics. It is, therefore, important to bring out the correlation between the ensuing crisis in global capitalism - including in India - and the impending crisis in our democracy - to the fore. The divergence in the requirements of the neo-liberal phase of capitalism and ‘democracy’ as its analogous political system seems to be the key in explaining the despair engulfing Indian polity at present. The attempts to transform ‘Democracies’ into ‘Corporatocracies’ that we see today, also emanate from this despondency alone. The last two decades have also seen the institution of ‘State’ posturing itself more and more aggressively against its own people in order to fulfill its obligations to international financial & trade institutions so to serve the interest of global capital. In such a course, it has extensively resorted to adopt the instrument of ‘fabricating’ cases against the voices of opposition to the interests of the global capital. Though the instrument of ‘fabrication’ is not new to the ‘State Craft’ but this time it is being used in a targeted and selective manner. Not only the existing criminal laws have been used for this purpose but new laws like UAPA and various state ‘security laws’ were created during this period to meet this requirement. The ‘Indian State’ is also proceeding feverishly to create a surveillance state through various means of ‘electronic surveillance’ using cutting edge technologies to track mobile phones, internet usage, emails etc. at home while colluding with U.S. military and security establishment internationally against other nations. The business of creating and sharing of its citizen’s databases (both demographic & biometrics etc) hasbeen promoted by Indian establishment by subverting the Constitution, existing norms of parliamentary democracy and citizens’ rights. It is in this context that INSAF has decided to hold its two day National Convention 2013. 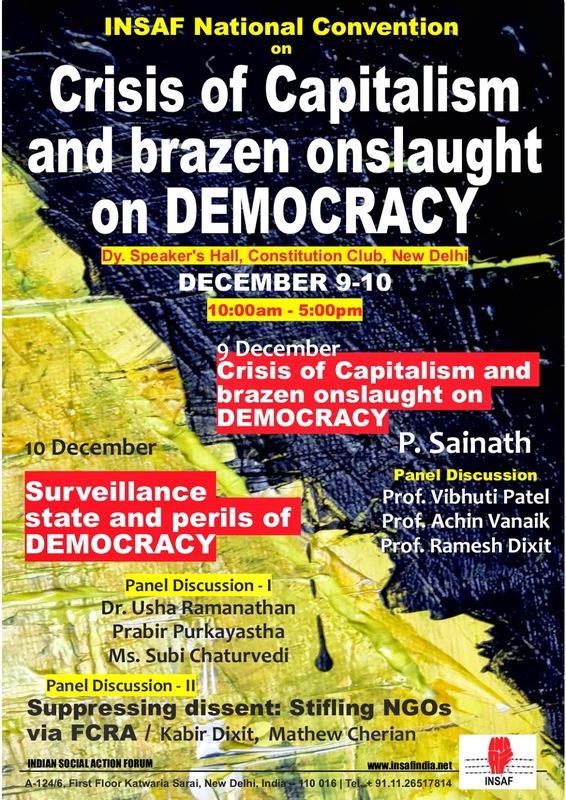 The convention was organised on 9-10 DECEMBER 2013 at the Constitution Club, New Delhi. 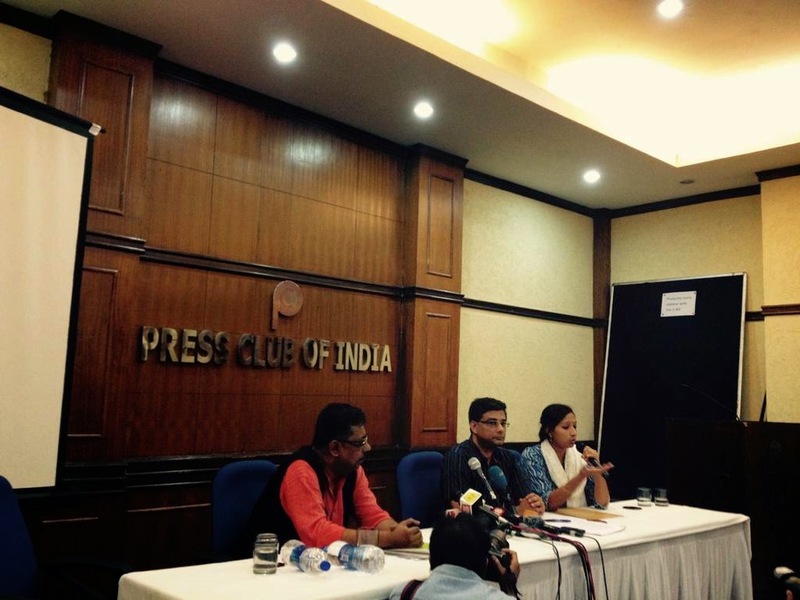 It was attended by over 350 grassroots activists, network leaders and intellectuals from all over India. The inaugural session was chaired by Justice Rajinder Sachar. Eminent writer and journalist, P.Sainath gave the inaugural address. He said that the entire 20th century could be summed up in three processes. 1. The rise and growth of democracy. 2. The rise and growth of corporate power. 3. The rise and growth of corporate propaganda to stifle the rise and growth of democracy. In the 21st century, corporate power and its propaganda machinery is at its greatest intensity than any other time of the world’s history. Sainath talked about the celebrations held in India for the advent of British Petroleum which is responsible for the largest oil-spill in the world. British petroleum is considered a victory for investment in India where Bhopal gas tragedy took place. He also emphasized on the content of the panel discussions of the elections. He said that the crony in crony capitalism is the media. He even mentioned that when Wall Street collapsed and the whole world was going through a economic recession, the only companies which made profit were the food, agricultural and water related companies. 60% of the wheat of the global market is controlled by index funds and investment funds. Hunger and thirst are the greatest crops of the world. The present phase of capitalism understands and recognizes that all resources linked to food and water must be grabbed. Hunger is not a function of scarcity and distribution but it is a function of super monopoly of profits. Industries of extraction which are responsible for the greatest displacements in the country are there as well. The response of the capitalist state is criminalization of dissent when people resist to such activities of the state. Sainath also spoke about the menace of capitalism which results in mass migration, malnourishment in children, farmers suicides, etc. He finally said that the oft-held view that 'legislations can solve all problems' is just an illusion. Chair Justice Rajinder Sachar opined that the constitution is not only drafted by fathers but also by mothers. He said that it is written in the preamble of our constitution that India is a socialist state but actually it is not followed. Those who do not recognize the preamble should be treated as traitors. He said that the state provides protection to the corporates rather than the people. The first speaker of the next session (panel discussion) was Prof. Vibhuti Patel, Director, Centre for Study of Social Exclusion and Inclusive Policy, SNDT Women's University, Mumbai. She said that in the name of economic policies the policies which the government is bringing is totally anti-people. She talked about the wretched conditions of the workers and the unorganized sector. She explained the difference between the labourers who have education and skills and the labourers which do not have them. She stated how capitalism pampers only those limited people who have skills and deprive the others of everything. She said that the condition of women is extremely poor because of capitalism as they have been reduced to a commodity. She mentioned the increasing disparity of the rich and poor. Prof. Achin Vanaik (former Dean of Social Sciences, Delhi University) said that at the macro level, there is some democracy in India. There are some rights and governance but at the micro level there is total undemocracy. When capitalism changes, democracy also changes its form. Since 1991 there has been a rightward shift in Indian democracy and this phenomena is dangerous for Indian democracy. This shift of democracy affected all the minorities of India, ie. the class minorities, caste minorities, religious minorities, ethnic minorities and adivasis, landless labourers and women the most. Prof. Ramesh Dixit from Lucknow (UP) said that the relationship of capitalism and democracy started with the French revolution with the slogans of liberty, equality and fraternity. These are the slogans which unfolds the system which today we know as democracy. But over time, according to the requirements of capitalism, things have changed. The state as an institution is moving towards fascist design and doesn’t depend on any individual party. Democracy still has potential and if all the oppressed minorities are united then we can find some relief. The second day started with a panel on”Surveillance state and perils of DEMOCRACY.” Snehashish Ghosh from Centre for Internet & Society, Bangalore said that surveillance on people should be done within a fair, just and reasonable process. He spoke about targeted surveillance and blanket surveillance. Ms. Subi Chaturvedi (Asstt. Prof. of Journalism & Communication, Lady Shri Ram College for Women, Delhi Univ. & Founder & Hon. Managing Trustee, Media For Change) spoke about the role of internet and media in todays time. She explained the various aspects of surveillance. When advertising becomes more important than editorial policies then the media will lose on its ethics and values. That’s what has happened with media in this capitalist world. The matter of corporate control and surveillance is somehow related. Prabir Purkayastha of Delhi Science Forum said that there are three kinds of surveillance. The first kind is by the state and the country. The second is mass surveillance and the third kind is surveillance by companies. When crime takes place, surveillance can be done on that person. But mass surveillance is not justified in any way. There is no legal framework for mass surveillance. Internet should be given a basic legal framework. The concluding panel was on “Suppressing dissent: Stifling NGOs via FCRA.” Supreme Court advocate Kabir Dixit said that in a democracy it is our right to read, write and voice our view. It is even a right to associate and organize on the basis of the opinions, it is our fundamental right to raise resources for the exercise of organizing and expressing our views. FCRA wants us to be embarrassed about being political, embarrassed about organizing and raising resources. Political organizations are basically barred from raising funds. Mathew Cherian, Chairperson of Credibility Alliance said that his position on FCRA is that it is against voluntary action. FCRA says that people who work with poor and the backward class are political. He gives suggestions to the various organizations, asks them to write down accounts in a very transparent manner. The accounts should be shown to the people and all the organizations should unite and fight against such laws as FCRA.